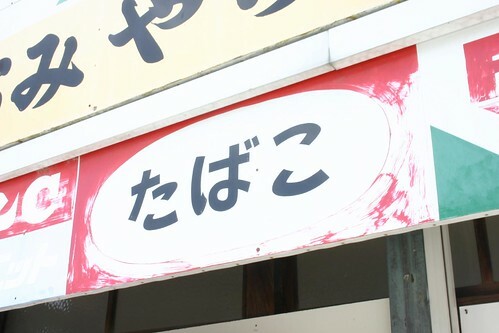 Most loanwords from languages other than Chinese are written in Katakana, but some foreign words are written in Hiragana, such as "Tabako," as on this sign. Tabako was taken from Dutch apparently, and has been in the Japanese language for so long that it is considered to be a Japanese word. I can't think of any other hidden loan words (もぐり外来語) can you? I was thinking of words like banana or kyabetsu but they are all written in Katakana too. The word for "name" has a tremendous amount of similarity in many languages in the world, but this site site that the Japanese "na" is from "ne" or sound. Aha, the author of the above referenced site says that there are quite a few words such as "karuta," from the Portuguese "carta" and "tempura," from the Portuguese "tempero". There will be an article, in Japanese, on this issue at the "Gogeyuraijiten" (dictionary of etymological origins) soon.